For many elderly, disabled or post-surgery people, using the toilet is a very personal session and anything that allows for independent use will help in returning and increasing their dignity and self-confidence. There are many options for improving one’s toilet experience. The raised toilet can be a hassle free installation for any handicap toilet. A raised toilet can make the wheelchair toilet transfer an easier transition. Raised toilets can also help those who have trouble getting back up from the toilet. It requires no additional cleanup and can return you to normalcy. Having the ability to sit down and stand up after surgery without impeding the rehabilitation process is crucial for a good recovery. One of the simplest ways to reduce the strain on your knees or after hip replacement surgery is to use elevated seats on a toilet. Make sure that when you are sitting down, you do not bend more than 90 degrees at your hip. The raised toilet seats and rail supports help you with that effort. There is no correct height for toilet seats for people after hip surgery but the recommended hip surgery toilet heights are 17 to 19 inches. Here are some recommended raised toilet seat products. Lightweight Raised Toilet Seat with Brackets – Lightweight with adjustable brackets that helps secure to toilet so it does not move around. Holds up to 280lbs and raises the toilet seat an additional 3.75 inches. Very simple to install and detach. Raised Hinged Toilet Seat with Closing Lid – This is a hinged toilet seat elevated an additional 3 inches for your comfort. This product has minimal installation and is used like your standard toilet. The elevated seat has a lid that can be closed. Works on standard toilets and support up to 400lbs. This elevated toilet seat has removable padded armrests, making it easier to stand up from a seated position. Below is a product similar to the previously recommended toilet seat and some added locking mechanism. The medline toilet seat has toilet safety rails on the side for more support. Make sure to stand up with both hands pushing off on the toilet rails. Too much pressure on one side might cause the product to get dislodged and possibly increase your chances of injury. This is a simple raised seat made of unbreakable polyethylene that is easy to clean. It comes in blue and white colors. Much more affordable than the previous two products but lacks the toilet arms. You can choose to install elevated toilet risers on the bottom portion of a toilet or attach it to the top section. The bottom installation is more difficult and requires more work hours but is well concealed and is aesthetically pleasing. The top installation is simple and requires nothing more than placing the toilet riser on top and a few snaps and locks. To uninstall and use as a portable handicapped toilet seats, you just need to reverse the process. These portable toilet seats can fit on most standard toilets found in homes and hotels. Attaching the plastic toilet seat riser might be unsightly for some people’s preference but there are newer stylish and contemporary models that blend well with the porcelain. Either one will help in keeping a leveled position for a wheelchair. Here are two stylish toilet seats. hips and knees due to the wider angles and involves less squatting. Toilet seat risers also help to level the wheelchair height with the toilet height to make it easier for a wheelchair to toilet transfer. The elevated plastic toilet seats usually have maximum user weight limits up to 250lbs. 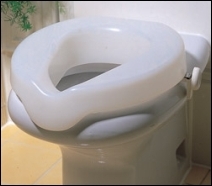 However, there are raised toilets seats made of strong polyethylene and can support weights higher than 250lbs. Handicapped toilet risers also have non slip surfaces and rubber discs that grip on to the toilet seat. There are risers that come attached with built in arms on the sides for additional help when you sit or stand from a toilet. Handicap and elevated toilet seats have optional lids that can cover the toilet bowl after use. However, there are some toilet seats that can block the original lids from closing. Make sure the new raised toilet seats have a lid built on if you want this option. This is not a problem with toilet risers installed at the bottom portion of a toilet. Toilet seat risers are quite affordable and will fit most regular or oval shaped toilets. Installation consists of lifting the existing toilet lid and seat, then inserting the elevated toilet riser on the top of the toilet bowl. The process is simple and does not require heavy lifting since the risers are lightweight. If you want an alternative to raised toilets, a portable handicap commode is a suitable solution, especially for people with limited mobility. If you need portable raised toilets during your travels, commodes are the best portable handicap toilets for your needs. Simply get one that is foldable and easy to store away in your vehicle such as this folding commode. If it is not high enough, place a seat riser on top. If you intend on purchasing a bathroom toilet riser, with arms or grips on the sides, make sure to put equal pressure on the grips as you get on or off. What could happen is, the riser may become detached from the bowl from one side and cause the entire piece to come off. Be careful and you will avoid a falling injury. I recommend buying some toilet safety rails in addition to the toilet risers. The safety rails provide much more stability without worry of toppling over while you get off the elevated toilet seats. Check out the raised toilet seat section at our store for more handicapped equipment options. 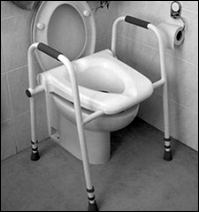 You can find and buy raised toilet seats, grab bars and safety rails at competitive prices.